Dave is the Clinic Manager in Norwell. He graduated from Northeastern University with his Doctorate of Physical Therapy after receiving his B.S. in Rehabilitation Sciences. Dave underwent physical therapy himself after sustaining an injury in high school, which sparked his interest and passion in helping others. Dave has experience treating a wide range of orthopedic injuries, sports injuries, vestibular, and concussion rehab. 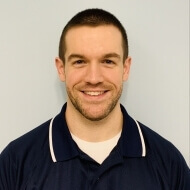 Dave enjoys working with people of all ages and loves seeing his patients return to their prior level of function using a combination of manual therapy and functional exercise. Dave is also a mentor for newer therapists and enjoys his role in education as he is a clinical instructor as well. Dave played hockey and baseball at Hingham High, and club baseball for Northeastern University. He continues to follow his passion for baseball by playing for a league based in Boston. Dave enjoys spending time with friends, trying new restaurants with his wife, and at the end of the day coming home to their rescue dog, Rawley.